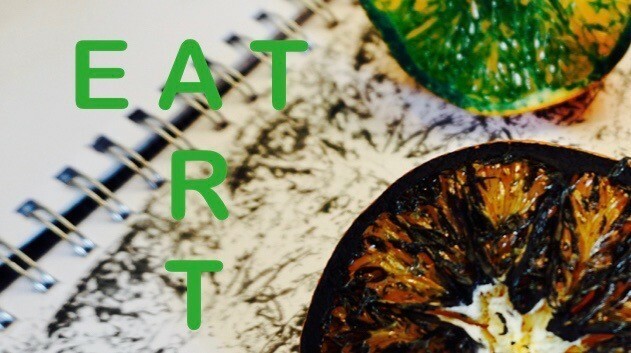 EAT ART aims to examine how food and art bring people together and create a synergistic platform for imagination, interaction and conversation. Sharing recipes and food sparks dialogue about cultural identity while simultaneously awakening our curiosity. EAT ART is a project initiated by artist Liz Nilsson which gathers people around food. This project aims to examine how food and art bring people together and create a synergistic platform for imagination, interaction and conversation. Sharing recipes and food sparks dialogue about cultural identity while simultaneously awakening our curiosity. The participants at each gathering will share food & recipes and engage in mindful colour studies, meditative block-print pattern making and creative writing practice, all inspired by the ingredients and process of cooking. The project will travel from place to place, nationally and internationally, over a two year period, starting in Dublin in January 2017. The outcomes from the project will be recorded as written observations, recipes and artworks. These will be documented in a cumulative blog/website with the illustrated cookbook and visual motifs reproduced. The website will be both a project tool and a living archive. IN JANUARY 2017 EIGHT PEOPLE GATHERD IN MY KITCHEN AND STUDIO TO TRY THE IDEA OF MEETING AND SHARING FOOD, RECIPES, MEMORIES AND TO MINDFULLY AND CREATIVELY LOOK AT THE INGREDIENTS. THE TEXTS BELOW ARE WRITTEN DOCUMENTATIONS OF THREE SESSIONS IN THE PROJECT WRITTEN BY VARIOUS PARTICIPANTS OF THE GROUP. Today we began the project with the working title The Pattern Cookbook created by our friend Liz, who persuaded old and new friends to work together on this exciting project. We each had to make and bring our favourite dish, so it was a day of sharing starters and desserts. A day of writing and finding a way to share the recipes we love, to breath in the ache of chocolate, the tang of raspberries, the colour of beetroot, mouths watering to lemon and cumin. It was a day of moving around the table, observing and drawing each dish with our left hand and then moving again and adding words to our drawings, free writing and having the courage to read it out, to feel trust in the room and to feel that we had created this energy of voice and making marks, our food and writing evoking memories, and reflections, that were vivid and real. A chance to then sit around the table beautifully set for lunch upstairs, eat and talk about food. We talked about how lucky we were to be able to come together and do this. Food is healing we thought and a joy. A joy to bite into the nutty brown bread with its flakes of walnut, the chocolate cake with its raspberry treasures, the smooth almond soup like a prayer, the comforting red soup that has travelled and held Elsie's name, the small glistening apple pies, the orange salad with its rose dressing that wafted through the room, the fluted madeleine, the Romanesque cauliflower in a field of lentils, the jewelled beetroot and my tarty plums. Each dish eliciting a memory. Outside the day was a soft pale note. We assembled in the hallway, drinking coffee and nibbling Amanda's delicious orange cake, while we waited in pleasurable anticipation of the day's creative prospects. In the studio, we loosened up with some gentle movement and breathing, then laid out our notebooks and tools, ready to dissect and analyse our chosen ingredients in word and image. Dividing our pages into four then nine frames, we zoomed in and out of garlic bulbs, pomegranates, cauliflower, raspberries, oranges, lemons, beetroot, onions, apples. With apologies to Bobby McGee, Marie hummed happily, "freedom's just another word for...... creative fun?" Then, it was time to get our fingers inky as we played with using our ingredients as stamps. There were some surprising and often beautiful results : pomegranates became oriental fans, and lemons Dublin fanlights; apples were bitten into..while onions and beetroot performed cartwheels over the paper; oranges dissolved into cobwebby lace, garlic bulbs blossomed and raspberries formed fragile arches. Absorbed in detail, we were surprised that lunchtime arrived so swiftly. We adjourned to the kitchen, where the table had again been set with care and artistry by Liz. Although not as protracted as the previous week, we nevertheless found time to discuss the recipes, swap cultural tales of table manners, AND enjoy the food too! After lunch, Amanda set us the challenge of producing haikus. Although she explained the concept and gave examples, there was much sighing and chewing of pencils before we took turns in presenting our work. Then, it was back to the drawing board, as we once more graphically explored our ingredients with ink and brush..
All this in preparation for the final week, for which we will produce rubber stamps and perhaps stencils based on the day's endeavours. We all agreed it was such a pleasurable indulgence to spend a whole day lost in the world of drawing, fuelled by the inspirational food of companionable meals. 10 am. Most of us arrived late and wet, blown in on a furious February wind, but welcomed by the smell of coffee wafting out through the open door. We spent a while in the hall chatting and eating Ann Cécile's delicious bonbons before moving in to the studio. Creatures of habit, we all took the same seats in the same places as the previous two weeks. 10.30. We began with some somatic work, stretches, and forming a conga line massaging one another's heads and shoulders. 10.45. Settling down to the business of the day, we began with colour exercises, focusing first of all on the full range of colours in our chosen dishes. 11.00 Focus then narrowed down to a single ingredient. Some of us found that the colour scheme for one ingredient was a good match for patterns generated by another. Continuing with a colour picking exercise, we experimented with stripes to indicate the proportions in which they appeared in the actual ingredient. We also tried out different effects, such as sprinkling salt onto built-up watercolours while they were still wet. The studio roared with the sound of hair-driers. 12.00 Tidying away the watercolours, we prepared to print. Some of us had already carved our print-blocks and were ready to start work. Others (naming no names) were less well organised. Trying to make up for lost time, I got careless with a craft knife and had to be brought to the chemist by Rosemary to have steri-strips applied to a cut thumb. On our return I was relieved to be lent some lino-cutting tools by Marie. The table was a patchwork of fabric taped down and laid out in grids of thread for even printing. 1pm. Moving upstairs, there was a magnificent spread for lunch: Rosemary's frittata, Barbara's quinoa salad, and two breads baked by Marie and Maggie. For dessert we had Ann Cécile's pancakes with Dublin honey and caramelized marmalade. Table talk revolved around family dinners, gender, and what constitutes good table manners in different cultures and different families. Ann Cécile told us that 2 February is celebrated as a feast day in France – Candlemas, or La Fête de la Chandeleur, which commemorates the purification of the Virgin Mary and the presentation of the Baby Jesus. It also features the custom of wrapping money up in a pancake and throwing it onto the top of a kitchen cupboard to ensure good fortune in the coming year. We did not try this in Liz's kitchen. 2.30pm. We moved back downstairs and continued with our printing - some wonderful patterns were emerging, ranging from large bold prints with apples, pomegranites and onions to smaller delicate patterns made with raspberries and small pieces cut from vegetables. Rosemary got a complete set of table napkins printed with her apple-inspired design. An hour or so later we wrote some notes on giant post-its with our impressions of the day's activities. Liz speculated about changing the name of the project from The Pattern Cookbook to something broader as the three days had been so wide-ranging. Then it was time to give the table covering a very thorough scrub, wish Liz well on her travels in India, and head back to our 'real lives'. After a thoroughly successful three days we discussed the possibility of getting together again later in the spring, possibly for a picnic.